Sam (in white thobe), pictured here with (l-r) Majed Olayan, Majed Bandar and Fahad Olayan, is given expert Bedouin instruction in hunting desert quail with an heirloom 12-gauge, single-shot shotgun! 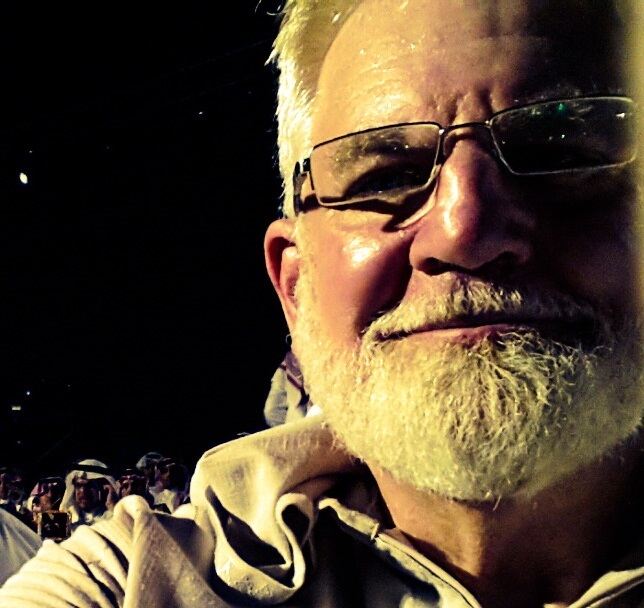 Abdullah Al Ghamdi picked me up yesterday afternoon, and we headed for a rendezvous with my Bedouin friends near the Red Sea coast town of Radigh–about 150 miles north of Jeddah, Saudi Arabia. There we met up with the Olayan brothers Majed and Fahad and their friend Majed Bandar. Abdullah and I jumped into Fahad’s Toyota 4×4 Cruiser, and we drove out over and around the dunes into the Arabian desert. It led to an afternoon hunting desert quail and remembering how God provided manna and quail to the Children of Israel as they grumbled their way through the Sinai wilderness for some 40 years. Alas, having shot no quail, we set our sights on a few plastic bottles for target practice, and then headed into a nearby town to purchase some fresh red sea fish from a local market. Then we enjoyed an evening of Bedouin music, fried fish, rice and fresh frothy camel milk from a camel that was standing a few steps away! The majority of Bedouins in the past have traditionally lived a nomadic lifestyle, spreading from the Persian Gulf all the way across northern Africa to the Atlantic Ocean in West Africa, and from the borders of Turkey as far south as Yemen. The word “bedouin” comes from the Arab word bedou, meaning “desert dweller.” Estimates today indicate nomadic Bedouins constitute about one-tenth of the population of the Middle East. In my many meetings with Bedouins it has become all too apparent, that Bedouins regard themselves as the “true Arabs” and the “heirs of glory.” The family I visited yesterday were exultant when they showed me some of their 60 incredible camels and more than 1,000 very well shepherded goats. I’m very grateful to my Bedouin friends for hosting me for one of the most incredible days of my life. Bedouin families still enjoy desert life. Herding goats and camels is often a very profitable livelihood. Bedouin life is generally pastoral-desert; herding camels, sheep, goats and occasionally, when the climate is not so harsh, cattle. Through the centuries they have migrated seasonally, depending on grazing conditions. In winter, when there is some rain, they migrate deeper into the desert. In the hot, dry summer time, they camp around secure water sources. Bedouins define themselves as members of tribes and families. People are divided into social classes, depending on ancestry and profession. Passing from one class to another is relatively feasible, but marriage between a man and a woman of different meets with difficulty. Traditionally, the Bedouin’s home, the tent, is divided into three sections by curtains: the men’s section, the family section and the kitchen. In the men’s area, guests are received around the hearth where the host prepares coffee over the fire. This is the center of Bedouin social life. Tea is served as a welcome drink; coffee is usually prepared after the meal and is the last drink before the guest leaves. The serving of food and drink represents the generous hospitality of the host. The men pass the evening trading news and discussing their animals. Separated by a curtain, the women gather in the family area and kitchen along with their small children to bake bread and prepare the main meal. A dinner of rice and chunks of mutton or lamb are usually then served to the gathered guests. Women occupy a very important position in Bedouin society. Not only do they raise the children, they also share in herding the sheep, milking the animals, cooking, spinning yarn and making family clothes. Some even weave the heavy cloth that constitutes the tent. The Olayan brothers sing typical Bedouin tunes tapping out the beats on percussion instruments. Around our fire last evening, the Olayan brothers recited ancient Bedouin poetry and sang, accompanied by traditional percussion drums and cymbals Poetry has been a central cultural form of expression for the Bedouins since ancient times. In the early centuries of Islamic history, I’m told Bedouin poetry represented the ideal standard for other literary achievements, as well as for the refinement of the Arabic language. To mark the end of the evening, Ali, our host, burned incense in a mabkhara (incense burner) passing it to each of his guests to inhale and fan their clothes. The traditional Bedouin foods are fresh camel or goat milk and meat. 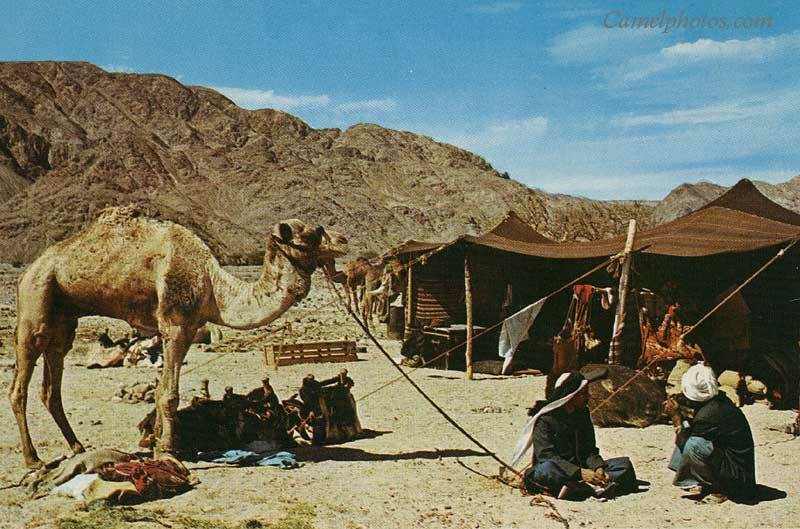 Bedouins usually sell and barter their animals and meat in exchange for fruits, vegetables, herbs and spices from other tribes or village markets. Bedouin society has a strict code of honor which dictates proper behavior for all members, including children. Because of the demanding nature of the Bedouin lifestyle, children are expected to assume a considerable amount of responsibility in order to help their families survive. Although modernization has changed the Bedouin lifestyle somewhat, emphasis is placed on teaching children to carry on traditional ways of life. While the advancement of modern technology is not considered terribly important to children’s education, as we sat around the fire last evening, I did notice two of the younger boys were captivated by video games they were playing on their dad’s smart phone. Islam’s prophet Mohammed was born and raised in the Bedouin tribe of the Quraish during the 7th Century. The Qur’an, believed to be first revealed to Mohammed by the Archangel Gabriel, was soon after written and compiled in the Arabic language. The first converts to Islam came from the Bedouin tribes living in and around Mecca. Therefore, Islam is embedded and deeply rooted in Bedouin culture. Although there are pockets of Christians in Middle East Bedouin tribes, especially in Palestine, by and large the word Bedouin is synonymous with being a follower of Islam or a “submitter” to God. Prayer is an integral part of Bedouin life. As there are no formal mosques in the desert, they pray where they are, performing the ritual washing, or with sand where water is not readily available. There they humbly bow their faces to the earth, facing Mecca, five times a day. In modern Arab states and Israel, Bedouins are faced with many challenges in their lifestyle, as their traditional Islamic, tribal culture has begun to mix with western practices. Men are more likely to adjust and interact with the modern cultures, but in many places women are still bound by honor and tradition to mostly stay within the family dwelling. They have in the past lacked opportunity for education and advancement, but in Saudi Arabia, the United Arab Emirates, Dubai and other more advanced nations, times are changing. As well, governments have a strong tendency to regulate Nomadic lifestyles since it is only then that taxation works. Providing services for the people also works best in an urban setting. Today, the Arab world has one of the highest rates of urbanization in the world. As traditional Bedouin lifestyle become less and less attractive, in Saudi Arabia, especially on the steppes many of these desert tribes live on, as tradition has a strong hold. But today, many Bedouins are now bowing to increasing pressure, opting to settle in urban areas. It was at a South Jeddah camel market last June that I met the Olayan brothers. Today, it is not uncommon to see a young Bedouin family building a house and living in it while their parents pitch their tent in the rear garden, where they will live very happily until the end of their days. I hope you’ll take a few moments to enjoy this short video of Jordanian Bedouin musicians!